Cantina, Liquid and Light Guide. New world technologies meet classic materials in the latest LED lighting designs from SONNEMAN Lighting. 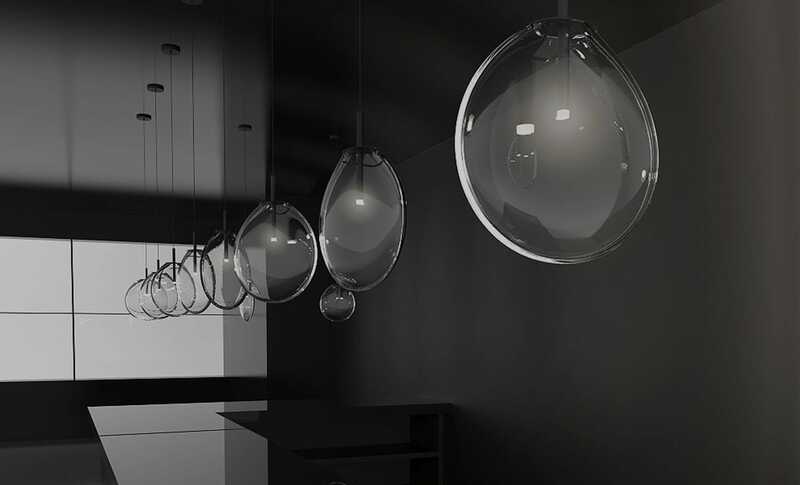 Three new lighting collections—Cantina, Liquid, and Light Guide Ring—use voluminous glass, organic shapes and sculptural minimalism to achieve the ultimate blend of form and function. Here, Robert Sonneman tells us more about these brand-new designs (available exclusively at Lumens!). What influenced the design of the Cantina and Liquid collections? Glass is an ancient art that has always been connected to lighting. It enables you to define volume and shape with the added dimension of transparence. It is interesting in its molten state and remains so as it cools to a solid. What became particularly interesting to me was connecting the Liquid’s large organic volume, in an amorphic melting state, to the minimal presence of a geometrically precise technology. Cantina’s broad face and narrow profile captured air in a volume that caused perception to change with rotation, creating a special aesthetic tension between scales with its minimal LED column. Cantina and Liquid share a thin-gauge suspension cord that allows the fixtures to float in space. Was this part of the original design scope? Both forms are even more sculpturally interesting suspended in tension from the thinnest, modern, stainless steel cables, challenging the visually expected with contrast between volume and scale. The metaphor of art and technology are continued with the unexpected contextual relationship of weight and mass carried by a gossamer-like thread. Cantina and Liquid also share a spreader system for larger configurations that is simplistic at first glance, yet is amazingly complex. How did you arrive at the final iteration? The goal with the system of spreaders was to provide utility without the visual weight of a heavy solid. Achieving mechanical strength from minimal structure requires a composition of elements that, while frail individually, form structural integrity when unified. These spreaders provide for the expansive arrangement of luminaires with a structural lightness. Several 2017 releases utilize a proprietary G4 LED bulb, including Cantina and Liquid. As a manufacturer that specializes in LED, what influences the decision to use a bulb versus integrated LED? I loved the geometric simplicity and unity of integration with the lens of the G4 LED bulb. It was inspiring to use in a variety of applications from both its visual and functional properties. I saw no additional lighting or visual value to be achieved by building an integrated LED construction. Light Guide Ring provides glare-free illumination. Tell us more about the technology behind the design. Floating within an aluminum ring, an LED source edge-lights a light guide disk that redirects its luminance to its upper and lower surfaces, producing a glare-free radiance. This occurs by introducing LED light at the edge of an acrylic disk, which has precisely engineered dot patterns etched onto its surface. These etched dot patterns act as light extraction points, redirecting the horizontally transmitted light through the flat disc surfaces. Apricot is a color that we recognize in several 2017 releases and is also used in SONNEMAN’s branding. Is this your favorite color? Apricot is a color that communicates light with a rich intensity. It is not necessarily my favorite color, but it is appropriate and vibrant to describe light especially in contrast with black, which is the absence of color. Apricot is associated with our identity, and we will continue to use it to identify our brand. What do you enjoy most about the lighting industry? Lighting is infinitely interesting and incredibly challenging on many levels. For me, it has been a creatively, mechanically and technically challenging activity, which seems to increase in interest as I pursue it. I am always seeking to understand more and learn new things. As an architectural practitioner and industrial designer, no single area has absorbed my ongoing curiosity as much as my 50-year pursuit in lighting innovation. As a modernist with a thirst to do more, I am thrilled to always be engaged and seeking what’s next.